This past week has been such a rich experience. 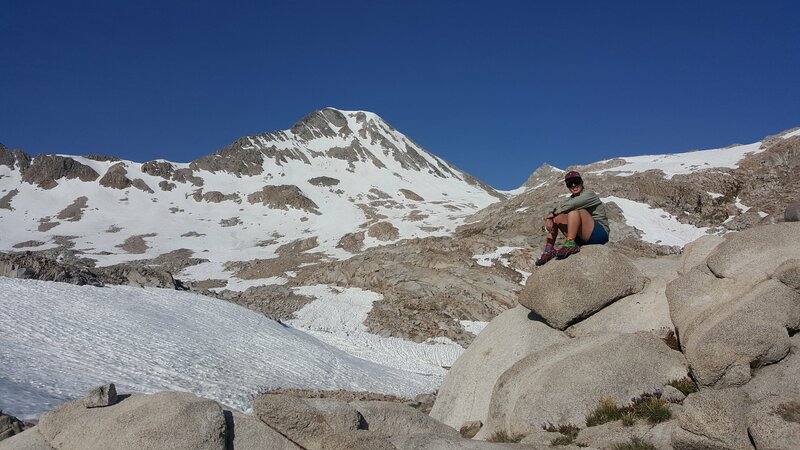 I swam in freezing cold lakes, felt the intensity of the sun while climbing up steep switchbacks, saw the setting sun light up the mountains, navigated around and over snow, and got to spend a whole week in the mountains with my two friends and relatively few other hikers. All of these reasons made this one of the most special stretches of the trail for me. Flamingo Sunrise jumping over some water. I can say with complete certainty that the hiking I’ve done this past week is the biggest physical challenge I’ve ever completed. We averaged about 17 miles (27 kilometers) daily, which involved going over a mountain pass each day. I haven’t calculated our elevation gain and loss for each day, but I’m sure it would be ridiculous. Our view on our way toward Muir Pass after an early morning start. 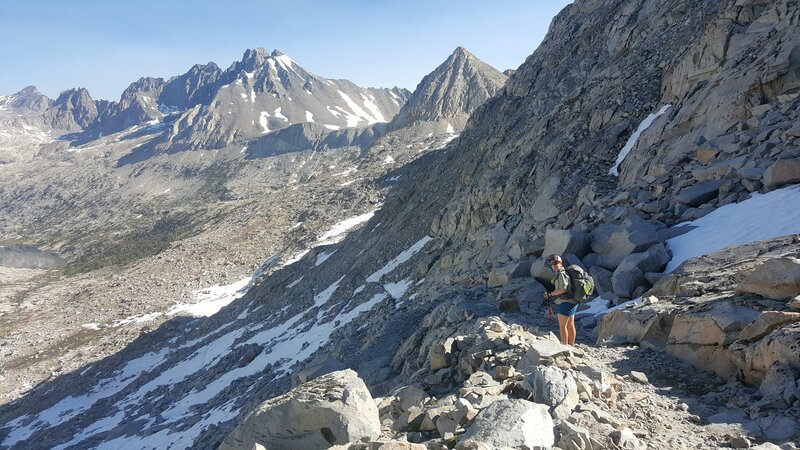 While preparing for the trail, my plan was to do enough research to be prepared, but not so much that it would take away some of the wonder and excitement. 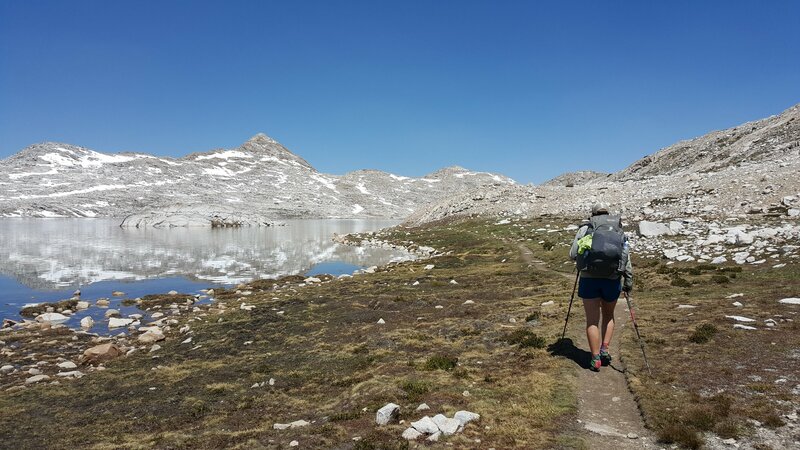 I knew that the Sierra section involved ridiculous elevation changes and that PCT hikers typically go over a pass a day. 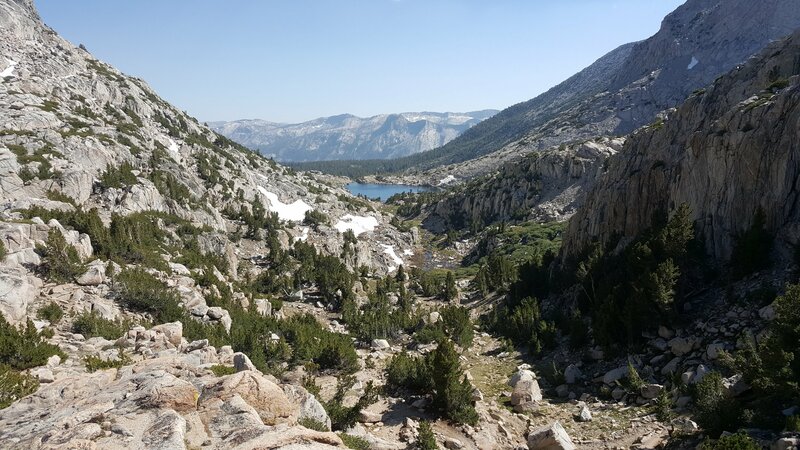 However, I didn’t know the names of the passes or the lakes, or what the mountains would look like – and I am so glad I didn’t. It has been a beautiful and challenging experience to go through these mountains. When I say we, I am referring to Flamingo Sunrise, Hot Tuna, and myself. 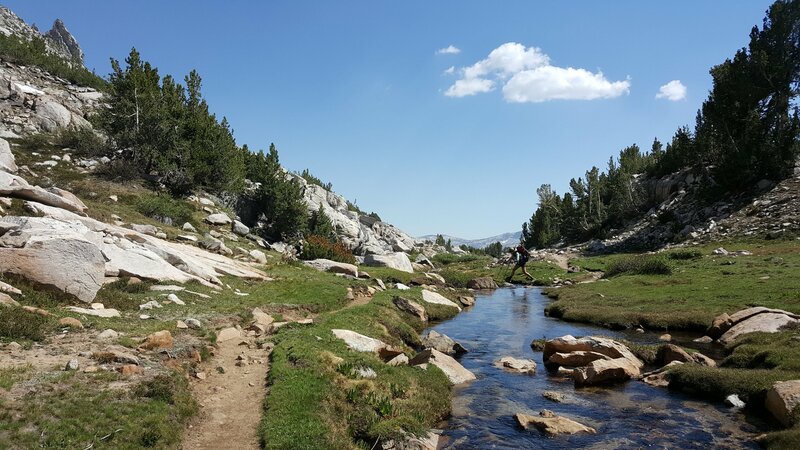 We have hiked most of the trail and all of the Sierra section together. There’s nobody else I’d rather cross rivers and travel across snow with. 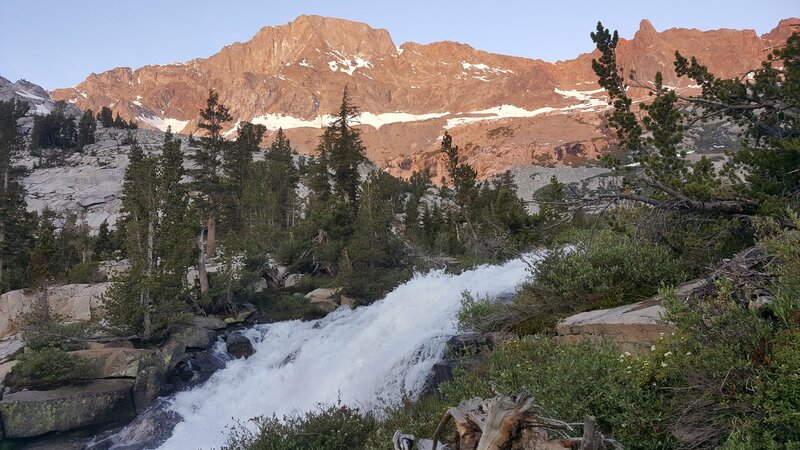 We have been fortunate to enter the Sierra at a time when the rivers haven’t been too difficult to ford. Furthermore, most of the snow has melted so it hasn’t been dangerous or slowed us down too much. Having some snow on the mountains has made the landscape more beautiful. So without further ado, here’s my summary of our week of passes. We had to take a nine-mile side trail off the PCT over this pass to get to the Onion Valley trailhead, where we hitched into the town of Bishop. It was a beautiful trail and nicely graded. 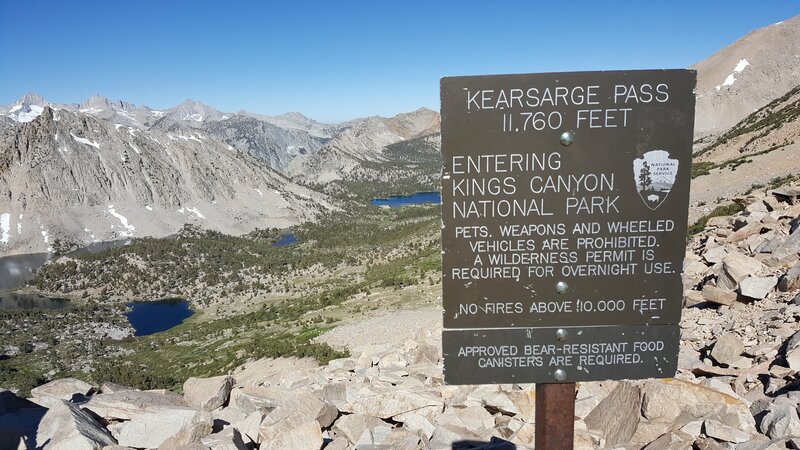 The sign marking Kearsarge Pass. 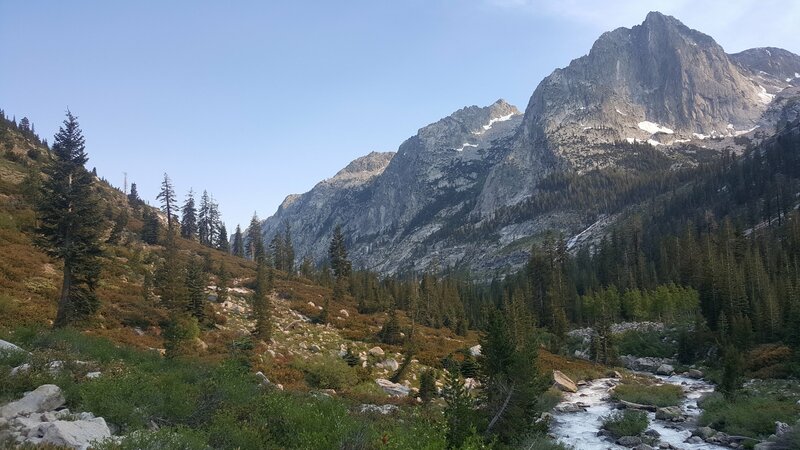 A view from the Kearsarge Pass trail. We got a ride back to the trailhead from a nice couple in their VW campervan. 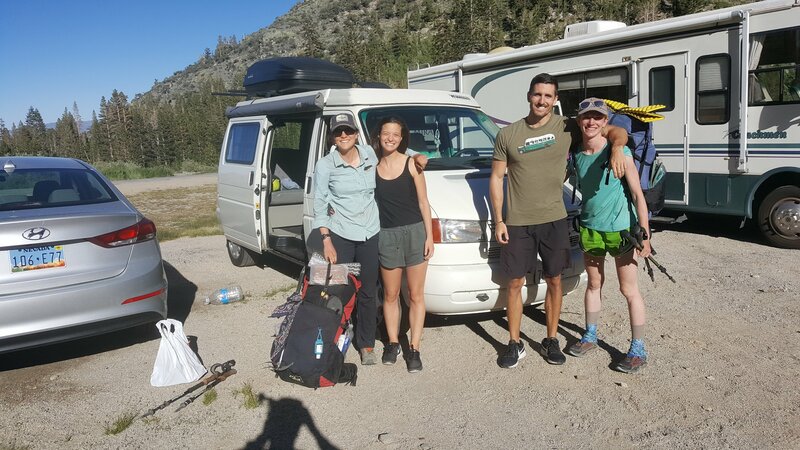 The additional weight of the three of us and our packs fully loaded with 7.5 days of food made the trip up the steep, windy road very difficult for the van. We were going so slowly I was seriously concerned that we were going to start seeing smoke and would have to contribute to repair costs. Our new friends and the van. The woman is Austrian and she was impressed that I knew who Anna Veith was (an Austrian ski racer). 7.5 days of food and insanely steep switchbacks make for some slow going up Glen Pass. On the way up we were passed by a female trail runner who was running up this gnarly trail to prepare for an upcoming 100-mile race. Can you spot the crazy switchbacks? 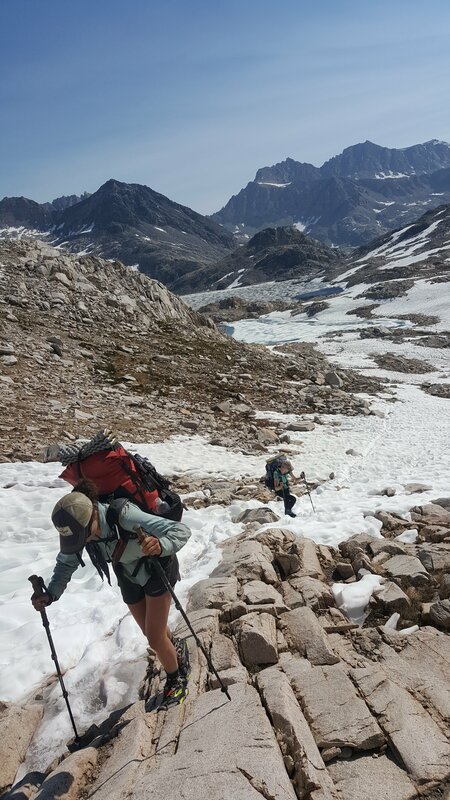 This might not have been too bad but our packs were heavy and we did Kearsarge Pass earlier that day. 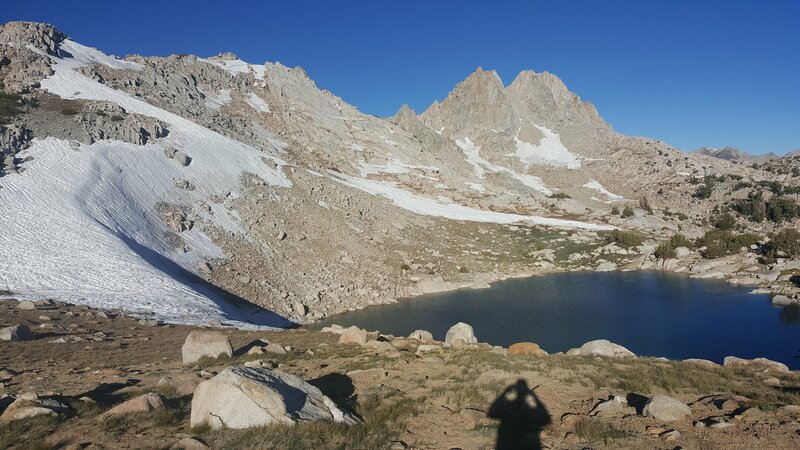 The view of Rae Lakes from the top of the pass was beautiful. Hikers at the top of Glen Pass. I was up and ready to go early the day we went over Pinchot Pass. It was snow free and a fun climb to the top. I had lunch and Flamingo and Tuna showed up shortly after. The view from the top of Pinchot Pass. The view from the opposite direction. 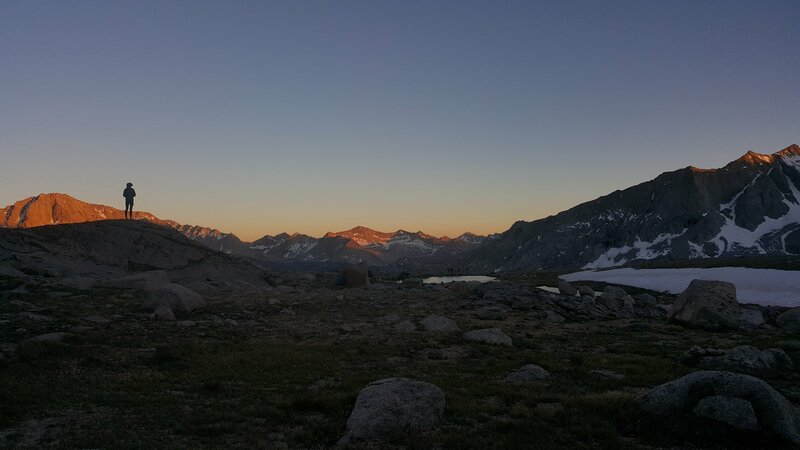 We camped below Mather Pass and went over early the next morning. The view from where we camped was one of the best I have seen. The light on the mountains as the sun went down was incredible. I took this photo of Hot Tuna, which is one of my favorites all trail. Hot Tuna in the evening light. Because we went over the pass early in the morning, the snow on the north side was solid, and we were very thankful to have our Microspikes to put on our trail runners. Descending the steep, icy slope would have been pretty sketchy without them. Here I am heading down Mather Pass. 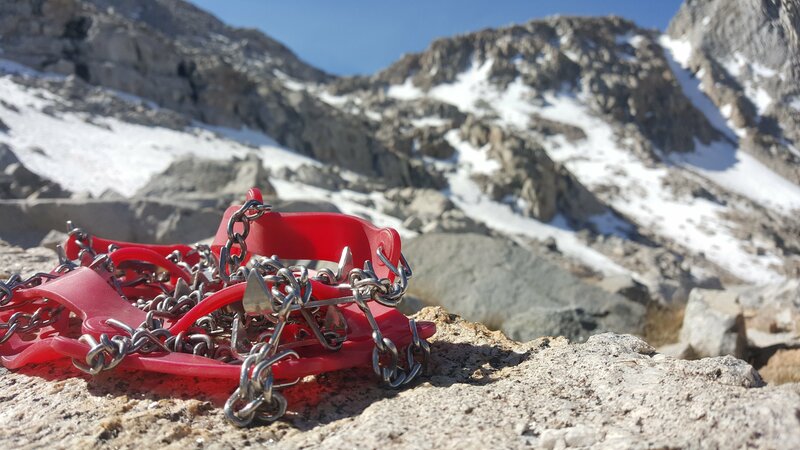 I was very thankful to have these Microspikes when we descended from Mather Pass. 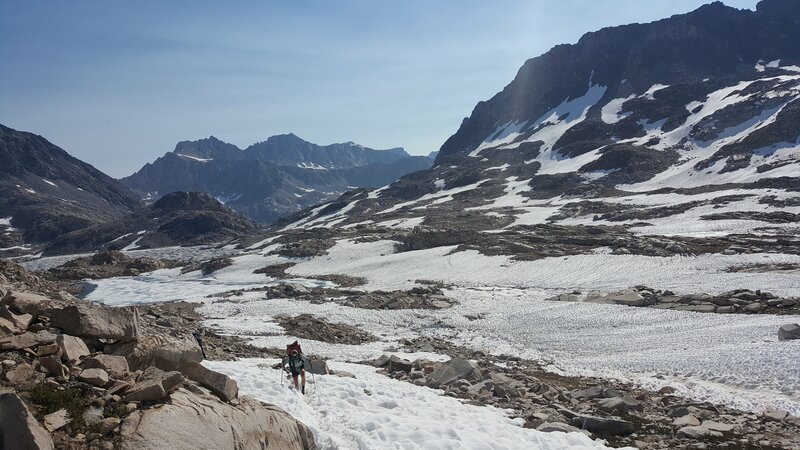 I think Muir Pass was my favorite overall pass experience. It required the most snow travel by far, which made it slow going but also challenging and fun. Route finding was difficult at times but it was neat to travel through such a snowy landscape, which is unlike most of the trail. We woke up at 4:15 a.m. that morning and were hiking by 5 a.m. so we could avoid too much postholing in the snow. We managed to travel up the pass fine with our Microspikes for the most part, except for one section where we postholed a bit. I fell through the snow up to my mid thigh a few times and I swore each time the ice would scrape my legs. Thankfully, this was a short section and I started having lots of fun again shortly after! Also, the Muir Hut at the top is a neat stone structure. Taking a break on our way toward the pass. Flamingo Sunrise working hard to get through the snow. 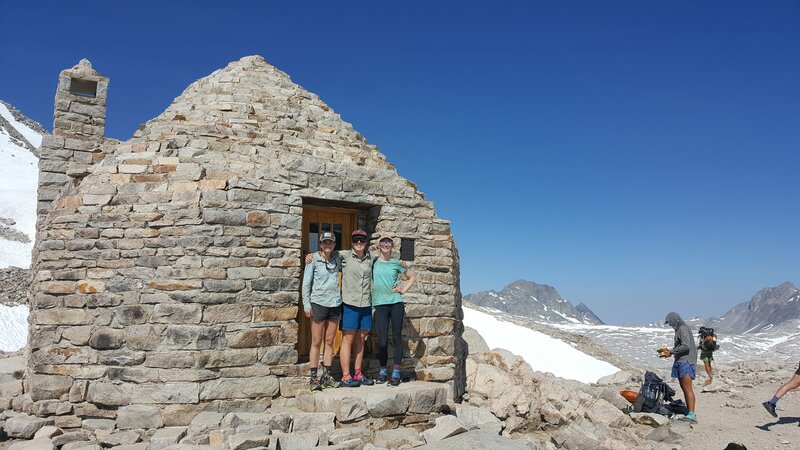 The three of us at the Muir Hut, at the top of Muir Pass. The inside of the Muir Hut was beautiful. 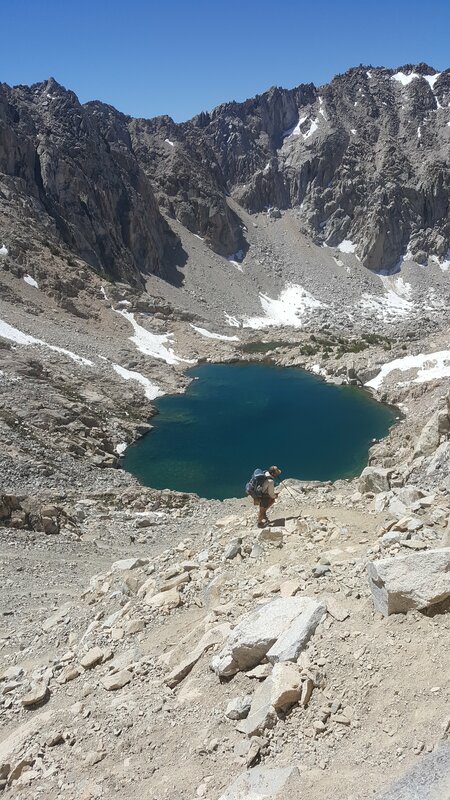 After descending Muir Pass we passed Wanda Lake, which was one of the most epic lakes I have ever seen. It was so reflective and blue at the same time. Another view of Wanda Lake. Some hikers were saying this didn’t actually count as a pass because it was so easy. After climbing up it, we agreed that it still qualifies. This is the side of Selden Pass that we climbed up. The other side of the pass – there are so many pretty lakes out here. Silver Pass seemed quite small in comparison to the other passes we had already gone over. There were some nice lakes on the way up and on the other side. In other news, I woke up a couple of days ago knowing that it was time for me to pick up a stove. For the past two months I have been stoveless; I cold soak my dinner for the last couple hours of hiking so it is ready to eat when I get to camp. I also soak my breakfast overnight. Most of my dinners have been some combination of rice, mashed potatoes, couscous, and refried beans. The most effective dinner table I have found yet. I got to eat while freezing my tired feet in the river. 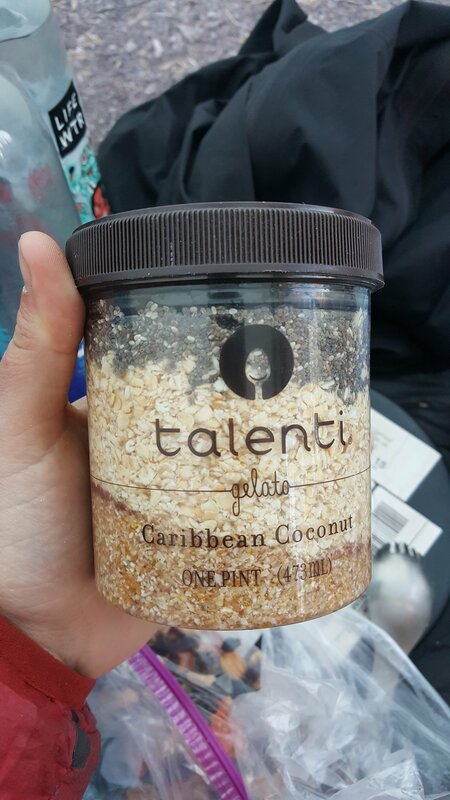 I have loved the convenience of getting to eat right away and not having to pack extra items. However, I am looking forward to the variety of dinners that I will be able to make with heat. My typical breakfast – ten grain cereal blend, rolled oats, chia seeds, chocolate breakfast essentials powder, and peanut butter. Shake, soak, and it’s ready to go in the morning. Our last two stretches of trail between resupplies have been about seven to eight days long. 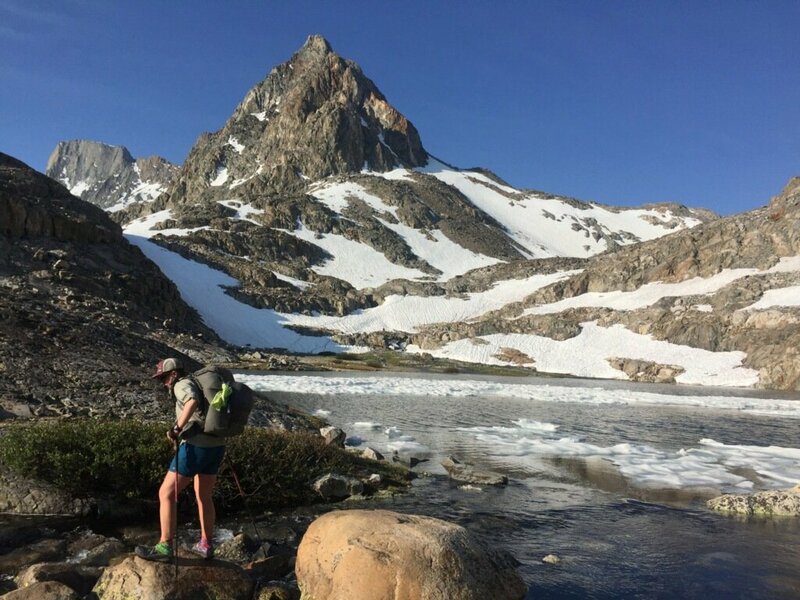 When you’re living a normal off-trail life it is great to get out of cell service for a while; it is refreshing to disconnect from social media and the constant connection that comes with having smartphones. 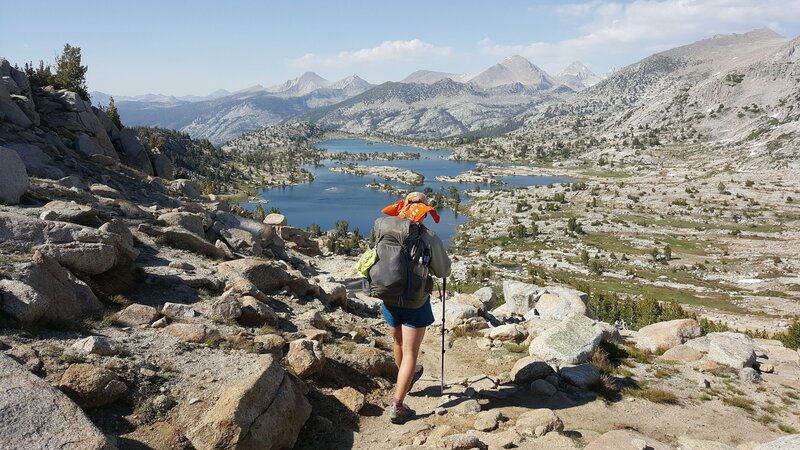 However, I’ve noticed that on a long trip like a thru-hike, I really enjoy getting emails and messages from family and friends – which I start to miss after about a week. I also love how useful smartphones can be on the trail, whether for navigating using the Guthooks app, using it for the camera, or listening to some music at the end of the day. Hiking in the early evening. At this point I was listening to some music, which made the experience even better for me. Thanks again to everyone who is following my hike and has showed so much love and support. Back to the trail I go. you are really rockin’ those rocks! so many rocks, mountains etc. I enjoy reading your blog journals. What an amazing journey you are on. Did HT and FS start the hike together? I.e. they already knew each other? how much time a day do you usually spend by yourself walking? Yes, HT and FS started the trail together. I am usually hiking near lots of people so I’m usually not totally alone, but I think I’m usually walking about 10-12 hours a day including breaks. Way to go Taylor. You’re literally walking on top of the world… or… the USA at least. I truly enjoy reading your fine writing and viewing the amazing sites. 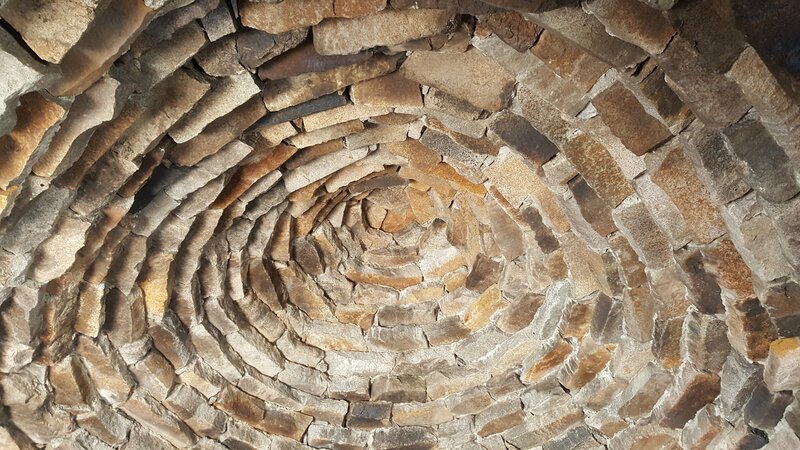 The stone work used to build Muir Cabin is impressive. I bet you’re going to enjoy your ‘gastronomic delights’ – HOT! I cannot believe that you did not not pack a small stove. Was the size and weight a concern? Thanks Pat. 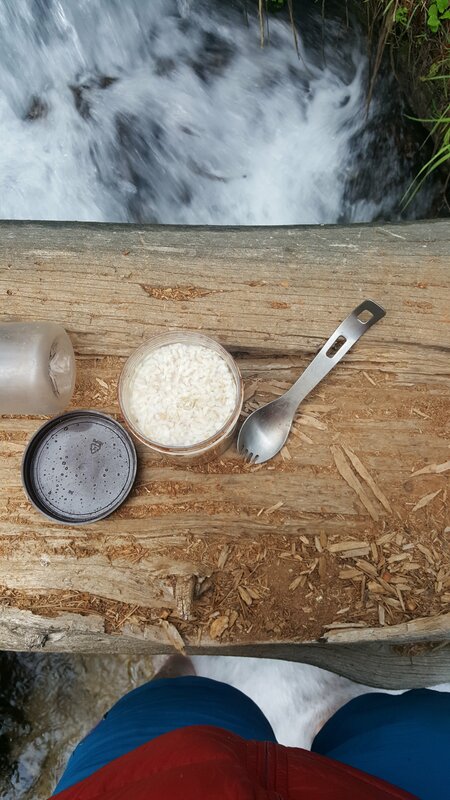 I was less concerned about the weight of a stove and pot – I just wanted the convenience of being able to eat right away after hiking!